Read books, magazines, newspapers, adverts and cereal boxes. 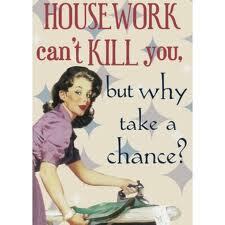 Some of the best advice concerning housework has come from things I've read. 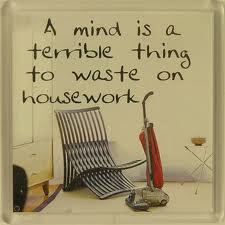 For example the phrase: "Cleaning the house while children are growing is like shovelling show while it's still snowing" which was written on a fridge magnet. (Please note: the Dramatic Arm Sweep is designed to attract attention to the clearness of the table and not the crumbiness of the floor. Please check your angle of sweep). Have quite a few children and space them four or five years apart. *Nods wisely* It takes patience, careful nurturing and occasional threatening to with-hold their pocket money but EVENTUALLY you WILL end up with someone totally capable of loading a washing machine or hoovering a floor and dusting a shelf. "AND your Grandma made me brush down the stairs EVERY WEEK. Never did me any harm." *sip long cool drink* *point* "You've missed a bit." (Note: Doesn't necessarily have to be true). "Beauty is in the eye of the beholder," They say and for once They are right. They are also right when they say: "If you can't see it, it doesn't hurt you." If you wear glasses. Take them off. If you don't. Find some to wear. It's remarkable how much of a stuff you can fail to give about dust if you don't notice it's there. NEVER invite anyone at all to your home OR if anyone shows the remotest interest or unhealthy curiousity in your shambolically untidy house (which OBVIOUSLY is just arty and, ahem, lived in) you can use the tried and tested "I'm sorry, we're soooo busy renovating the house at the moment" and fluff a bag of flour (preferably wholemeal for verisimilitude) under their nose in a Dust Confusion Episode (Warning: MAY require specialist training). So, I'm sure we all agree, these are both excellent and thoroughly appropriate housewifely tips and Morphy Richards are probably gagging at the mere prospect of enlisting me as one of their Innovators. Disclaimer: Mothers and Mother-in-Laws will completely rumble you. Yeah, sorry about that. Great post, very funny! I don't wear my glasses around the house, and so I never see the dust, which makes me feel much happier with the state of my house.